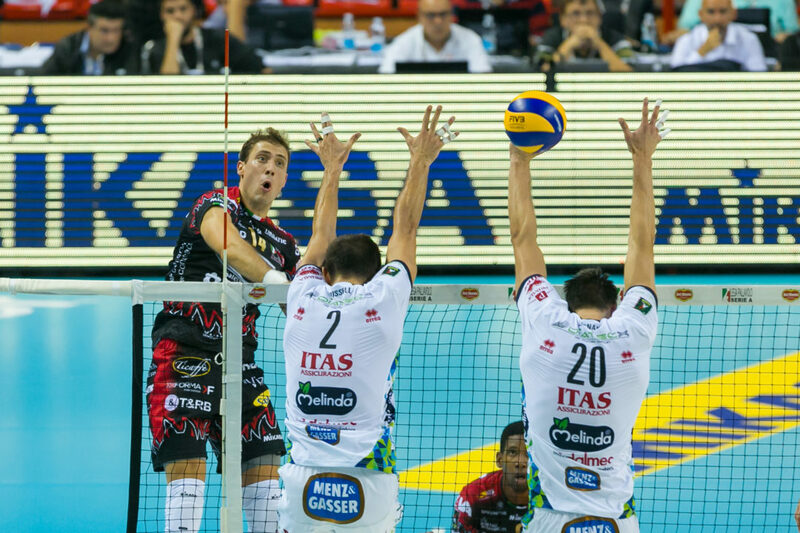 Perugia avenged a defeat suffered at the hands of Trentino in the SuperCoppa semifinals with a 3-1 SuperLega victory to remain perfect at 3-0 with 9 points. While Aaron Russell jumped out to a quick 6 points in the first set, it was ultimately Wilfredo Leon who willed his team to victory behind 21 kills, 1 block, and a match-high 4 service aces. Luciano DeCecco set Perugia to a .426 (58%) hitting percentage for the match. That mark was a vast improvement over the .142 (43%) attack average after the first set. While Leon led the way with 26 points, Aleksandar Atanasijevic scored 19 points at opposite for the Italian champions. His points came from 14 kills, 1 block, and 4 aces. Filipo Lanza put away 7 kills and 3 blocks from the left side. Marko Podrascanin scored 8 in the middle on 6 kills and 2 blocks with a .857 (86%) hitting percentage. Fabio Ricci finished with 4 kills and 2 blocks. Russell finished the game with a team-high 15 points. He scored on 12 kills, 2 blocks and 1 ace in the defeat. Uros Kovacevic put up 12 points on 8 kills, 1 block, and 3 aces. He did not commit an attack error in 12 attempts. Srecko Lisinac also scored 12 points in the middle for Trentino. Luca Vettori finished with 10 points from the right side. Maurice Torres paced his team with 18 points to lead Padova to their first victory of the season. Torres, an opposite from Puerto Rico who played at Pepperdine University in California, finished with 13 kills, 2 blocks, and 3 aces from the service line. Luigi Randazzo scored 11 from the outside hitter position, and Yacine Louati put up 10 points on 8 kills, 1 block and 1 ace. Dragan Travica scored 6 points as the setter, including 3 aces.